These advanced isometric exercises on the exercise ball can strengthen your abs and back, enhance athletic performance, and increase core stability. If you've read my page on plank variations then you know that the plank is one of my favorite exercises. 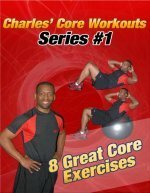 And if you've read the page on the exercise ball you know that the stability ball is one of my favorite tools to increase core stability. So these advanced exercises are simply a combination of those two principles. To perform the exercise, you simply hold the position without moving. The challenge is staying still when the stability ball starts to move underneath you. Because the exercise ball challenges your balance, it is harder to keep your alignment and your abs and shoulders work much harder than during the floor. plank. Starting Position: Start by placing your elbows on the ball. Balance on your toes, while keeping your body in a straight line. Form: This is an isometric exercise, which simply means that you hold the same position without moving. Hold for 10-30 seconds. Personal Trainer Tips: Make sure that you keep your body in a straight line. Keep your abs pulled in to stop your back from arching. If you feel your back arching too much, have someone (like a workout partner) support the ball so it doesn't move as much or simply go back to the regular floor plank and build up your endurance. Starting Position: Start by balancing on your hands and place your toes on the exercise ball, while keeping your body in a straight line. Form: This is a stability progression of the regular plank. Hold the same position for 10-30 seconds without moving. You can decrease the challenge slightly by resting on your ankles instead of your toes. When you are doing this exercise for the first few times, your body may start shaking. This is a result of muscle weakness and lack of coordination. After a little practice the shaking will stop and you will be able to hold this exercise for 30 seconds or more. If you feel this exercise is too difficult, simply go back and practice the plank more regularly. This is a great isometric exercise for the back. Starting Position: Start by sitting on the ball, and then roll your body down until your head and upper back are on the exercise ball. Your hips and lower back should not be on the stability ball. Form: Balance on your heels and simply hold this position for 10-30 seconds. Keep your body in a straight line. Personal Trainer Tips: The further you move your heels away from the ball, the more you will challenge your lower back muscles. If you keep your feet really close together that will increase the challenge on your stability and make this exercise harder. You can also vary your hand position to change the stability of this exercise. You may find it easier to balance if your hands are at your sides. These are advanced isometric exercises, so I recommend that you master the basics before trying these plank variations. They are also a lot of fun to master, so once you learn and master them teach someone else. Remember workout partners can really help to keep you motivated, so bring something new to your workout and keep working on your abs.